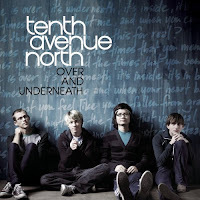 Today, I'm listening to the new album by Tenth Avenue North. The CD just came out today and is their first nationally released album called Over and Underneath. I am pretty impressed with the writing and the production of the CD and just getting in to many of the honest songs about faith, longing for Christ, worship, and the search for truth. More than anything, as I listen to the album, what I hear is heart. I thought I would share the message that Tenth Avenue North writes in the linear notes. It's well written, and I think probably does a pretty accurate job representing what Tenth Avenue North is about and what they're trying to achieve with this album. We as a band would like to take a moment to simply say thank you. Thanks for buying the record. Thanks for walking into a store, handing over some of your hard-earned cash and taking a chance on a band that you've probably never even heard of before. Seriously...thank you. Now, maybe you don't think it's such a momentous occasion. You know, buying a record, throwing it on your stereo, playing it in your car - maybe it's not such a big deal for you, but it is for us. You see, not only has making music become our livelihood, but this particular collection of songs - what we hope is not just another batch of catchy, chart-topping ego-boosting, melodies and lyrics to "get you through the day" - is actually an honest expression of what's been going on inside our heads and our hearts for quite some time. These songs are hard-worked, hard-thought, and carefully penned psalms coming from a group of individuals who don't have it all together, who desperately want to know truth, and and who aren't afraid to admit that they struggle to believe it. And we want you to join us, our desire for you, as you listen through tracks 1-11, is that you would not just bob your head and sing along, but that somehow, in some way, amidst all the words, notes, and musical mayhem, our hope is that you would encounter Christ. Encounter him, not just hear about Him, not just sing about Him, but truly, sincerely encounter Him. Granted, that's a serious undertaking, epic really. But that's the kind of guys we are. We have been seized by a great affection, and so we will continue to believe that others can be too. We hope you are in that number. He who has ears to hear, let him hear. Thanks again, and God Bless...Tenth Avenue North.